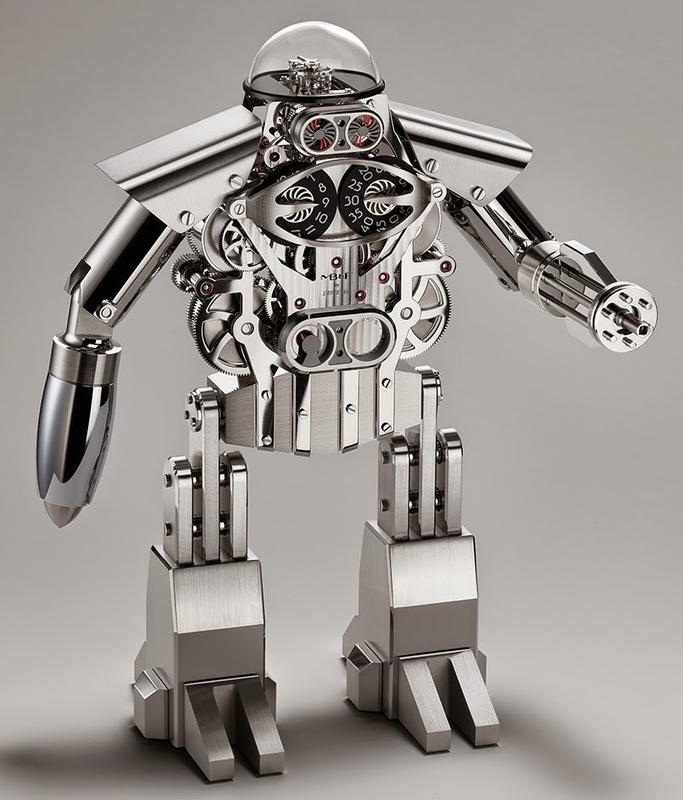 Conceived and developed by concept lab MB&F, and engineered and crafted by L’Epée 1839 – Switzerland’s only specialised high-end clock manufacture – Melchior is the result of Maximilian Büsser’s quest to revisit his childhood hankering for a robot friend. 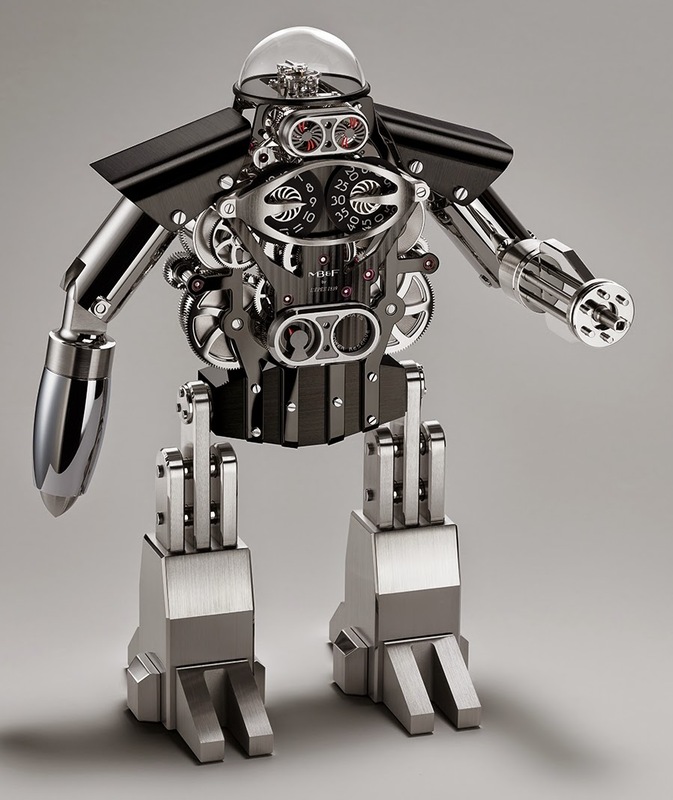 Christening this roboclock ‘Melchior’ – after a traditional forename in his family – Büsser developed the concept with designer Xin Wang, selecting a high-end L’Epée clock movement and reimagining it as the mechanical head and torso of a robot. Jumping hours and sweeping minutes on Melchior’s chest are displayed via discs bearing MB&F’s signature numerals – with pointers incorporated into the breastplate – while a dial on Melchior’s abdomen is the power reserve indicator. 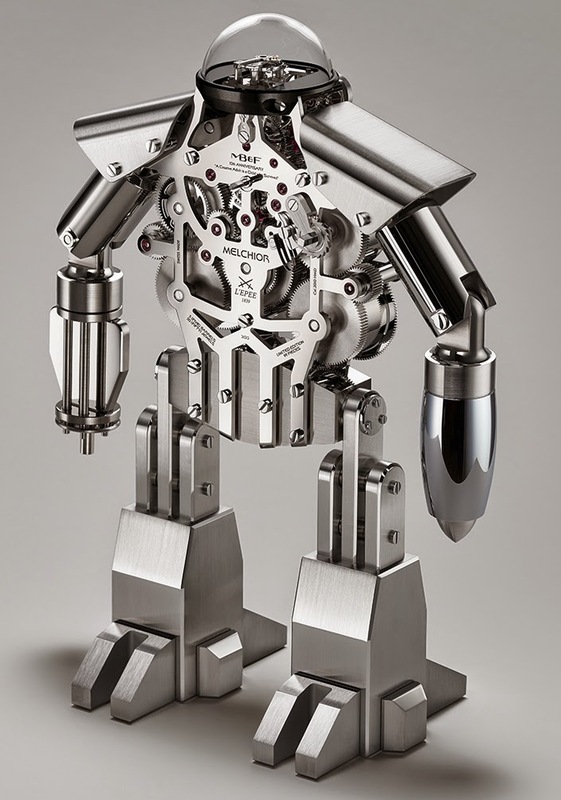 And this robot’s self-sufficiency is to be admired, for the finely-finished, highly-visible movement boasts a power reserve of 40 days – for most table clocks, it is eight days – thanks to five main spring barrels which help make up Melchior’s rippling torso. The barrels are in series for optimal performance. Melchior is limited to 99 pieces and is available in a monochromatic ‘light’ edition or a two-tone ‘dark and light’ edition featuring black PVD-treated components. The retrograde action of Melchior’s expressive eyes marks off intervals of 20 seconds. 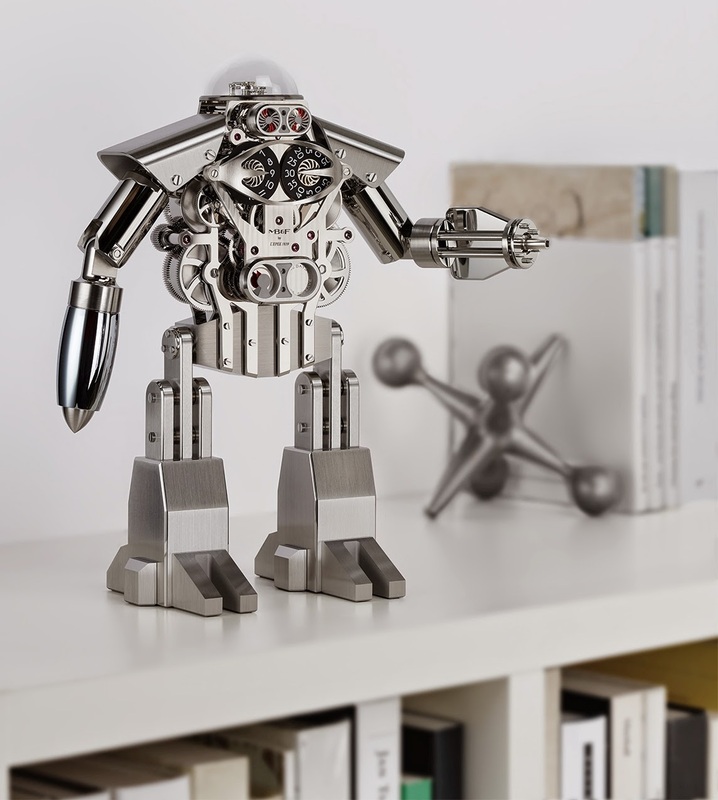 A combination of fixed vents and revolving discs, both bearing radial propeller motifs, gives the impression that Melchior is closing and opening his eyes – the resulting blinking effect endows the robot with a hint of endearing human-like personality. Further animation is provided by the regulator, its gentle beating and intricate composition made visible thanks to its polished glass dome cover. If the protective dome acts like a skull, then the regulator symbolises Melchior’s brain at work; just as the brain governs the body, the regulator governs the clock’s remarkable precision. The steel upper arms of Melchior rotate and his lower arms pivot up or down – excellent manoeuvrability for aiming his rocket launcher or Gatling gun to blast away the bad guys. And in a neat design touch, his gun detaches and doubles as the winding/setting key for the movement. Melchior comprises no fewer than 480 components, each one machined and finished at L’Epée’s Swiss atelier, bar the 50 movement jewels. An impressive 334 components make up the movement, while another 146 pieces comprise Melchior’s bodywork and armour. 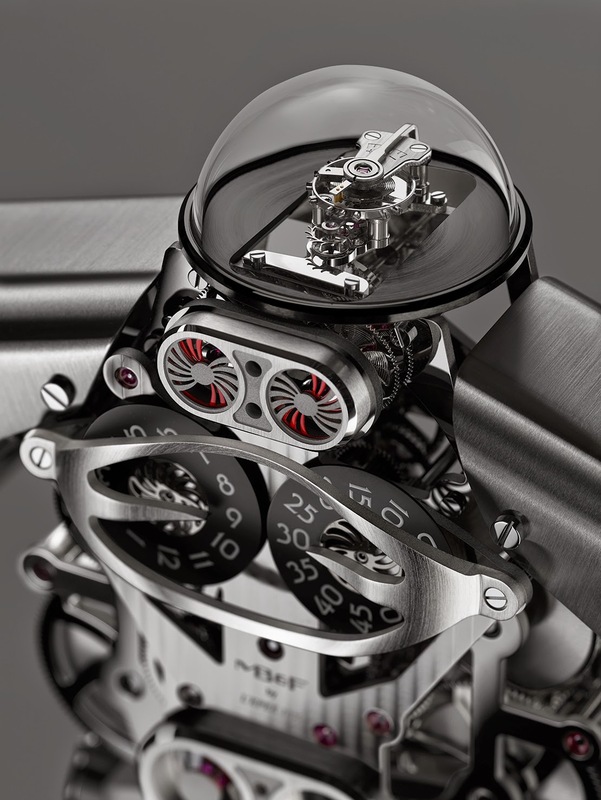 Such was the originality of MB&F’s robot concept that L’Epée needed to develop several new components: Machining, finishing and assembling a piece like the bulging glass dome forming Melchior’s skull was a first for L’Epée, as was crafting a stainless steel winding/time-setting key to resemble a Gatling gun. The winding/time-setting key clips into Melchior’s left elbow joint socket. It is held by a small magnet strong enough to hold the key, but not so powerful as to affect the function of the movement. The key boasts a double-depth square socket that neatly fits over both of the square pegs on the back of Melchior. One of the pegs is for winding the movement, the other for time-setting. Working from MB&F’s design, L’Epée diligently developed the various bodywork and armour components, carefully choosing materials according to the properties required. Where precision was critical – Melchior’s kinetic parts or his precision rocket launcher, for instance – plated brass was selected. His armour on the other hand is crafted mainly in stainless steel, providing optimal resistance to withstand any enemy attacks. And for the finishing touch, L’Epée have applied a range of eye-catching finishes to Melchior’s bodywork – including anglage, mirror polishing, satin finishing, circular satin finishing, sand-blasting and polishing. To create Melchior’s highly visible movement, L’Epée developed a completely new skeletonised mainplate, in palladium-plated brass, which sandwiches the movement mechanism, also in palladium-plated brass. 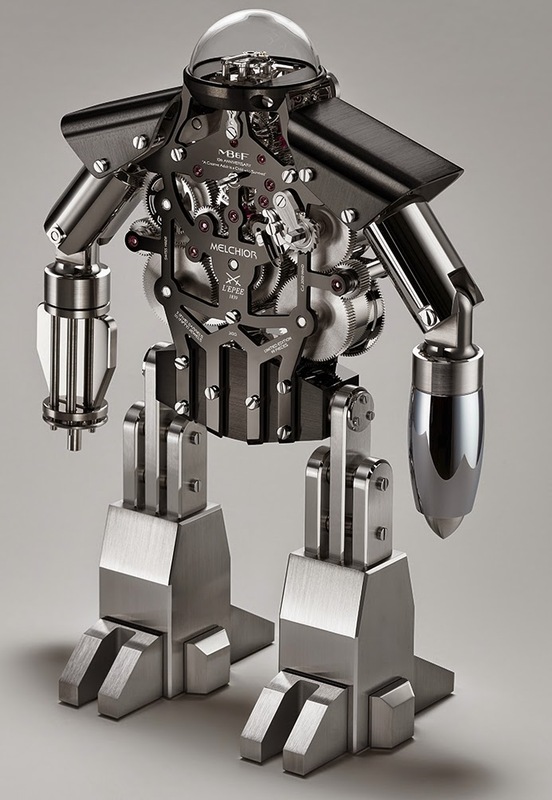 This mainplate – which forms the ribcage, breastplate, cheekbones and backbones of the robot – is black PVD-treated for the ‘darkand-light’ edition of Melchior. For clear reading of the hour, L’Epée developed a ‘slow’ jumping hour. This in-house complication sees the hour disc remain static for 55 minutes, then start to turn five minutes before the new hour so that the change of hour is smooth and subtle. The movement regulator features an Incabloc shock protection system, which minimises the risk of damage when the clock is being transported. This sort of shock protection is generally only seen in wristwatches. In fact, Melchior’s exclusive table clock movement features the same type of mechanisms as a wristwatch – gear train, mainspring barrel (here five, in series), balance wheel, escape wheel and anchor – but their dimensions are far larger. The movement also features superlative fine finishing – Côtes de Genève, anglage, polishing, sand-blasting, circular and vertical satin finishing – that is seen on a wristwatch. However, finely finishing a clock movement is far more challenging than finishing a wristwatch because of the greater surface areas of the larger components.